Western blot analysis of extracts from various cell lines using AGR2 (D9V2F) XP® Rabbit mAb (upper) and β-Actin (D6A8) Rabbit mAb #8457 (lower). 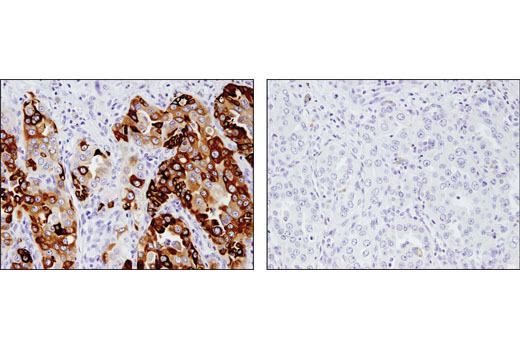 Immunohistochemical analysis of paraffin-embedded human breast adenocarcinoma using AGR2 (D9V2F) XP® Rabbit mAb. 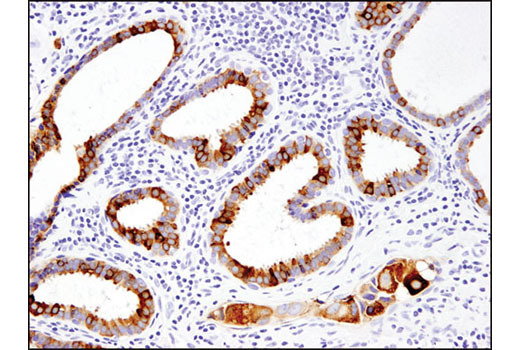 Immunohistochemical analysis of paraffin-embedded human non-small cell lung carcinoma using AGR2 (D9V2F) XP® Rabbit mAb in the presence of control peptide (left) and antigen-specific peptide (right). Confocal immunofluorescent analysis of MCF7 cells (positive, left) and IGROV-1 cells (negative, right) using AGR2 (D9V2F) XP® Rabbit mAb (green) and β-Actin (8H10D10) Mouse mAb #3700 (red). Blue pseudocolor= DRAQ5® #4084 (fluorescent DNA dye). Flow cytometric analysis of HeLa (blue) and MCF7 (green) cells using AGR2 (D9V2F) XP® Rabbit mAb. Anti-rabbit IgG (H+L), F(ab')2 Fragment (Alexa Fluor® 647 Conjugate) #4414 was used as a secondary antibody. 20X Phosphate Buffered Saline (PBS): (9808) To prepare 1L 1X PBS: add 50 ml 20X PBS to 950 ml dH2O, mix. Adjust pH to 8.0. Formaldehyde: 16%, methanol free, Polysciences, Inc. (cat# 18814), use fresh and store opened vials at 4°C in dark, dilute in 1X PBS for use. Blocking Buffer (1X PBS / 5% normal serum / 0.3% Triton™ X-100): To prepare 10 ml, add 0.5 ml normal serum from the same species as the secondary antibody (e.g., Normal Goat Serum (#5425)) and 0.5 mL 20X PBS to 9.0 mL dH2O, mix well. While stirring, add 30 µl Triton™ X-100. Antibody Dilution Buffer (1X PBS / 1% BSA / 0.3% Triton X-100): To prepare 10 ml, add 30 µl Triton™ X-100 to 10 ml 1X PBS. Mix well then add 0.1 g BSA (9998), mix. Prolong® Gold AntiFade Reagent (#9071), Prolong® Gold AntiFade Reagent with DAPI (#8961). NOTE: Cells should be grown, treated, fixed and stained directly in multiwell plates, chamber slides or on coverslips. Aspirate liquid, then cover cells to a depth of 2–3 mm with 4% formaldehyde in 1X PBS. NOTE: Formaldehyde is toxic, use only in fume hood. Allow cells to fix for 15 minutes at room temperature. Aspirate fixative, rinse three times in 1X PBS for 5 minutes each. Proceed with Immunostaining (Section C). NOTE: All subsequent incubations should be carried out at room temperature unless otherwise noted in a humid light-tight box or covered dish/plate to prevent drying and fluorochrome fading. Methanol Permeabilization Step: Cover cells with ice-cold 100% methanol (use enough to cover completely to a depth of 3–5 mm, DO NOT LET DRY), incubate in methanol for 10 minutes at –20°C, rinse in 1X PBS for 5 minutes. Block specimen in Blocking Buffer for 60 minutes. While blocking, prepare primary antibody by diluting as indicated on datasheet in Antibody Dilution Buffer. Aspirate blocking solution, apply diluted primary antibody. Rinse three times in 1X PBS for 5 minutes each. Incubate specimen in fluorochrome-conjugated secondary antibody diluted in Antibody Dilution Buffer for 1–2 hours at room temperature in dark. Rinse in 1X PBS as in step 6. Coverslip slides with Prolong® Gold Antifade Reagent (#9071), Prolong® Gold AntiFade Reagent with DAPI (#8961). For best results examine specimens immediately using appropriate excitation wavelength. For long term storage, store slides flat at 4°C protected from light. Incubation Buffer: Dissolve 0.5 g Bovine Serum Albumin (BSA) (#9998) in 100 ml 1X PBS. Store at 4°C. NOTE: If using whole blood, lyse red blood cells and wash by centrifugation prior to fixation. Collect cells by centrifugation and aspirate supernatant. Resuspend cells in 0.5-1 ml 1X PBS. Add formaldehyde to obtain a final concentration of 4%. Fix for 15 min at room temperature. Wash by centrifugation with excess 1X PBS. Discard supernatant in appropriate waste container. Resuspend cells in 0.5-1 ml 1X PBS. Permeabilize cells by adding ice-cold 100% methanol slowly to pre-chilled cells, while gently vortexing, to a final concentration of 90% methanol. Incubate 30 min on ice. Proceed with immunostaining (Section D) or store cells at -20°C in 90% methanol. NOTE: Count cells using a hemocytometer or alternative method. Aliquot desired number of cells into tubes or wells. Wash cells by centrifugation in excess 1X PBS to remove methanol. Discard supernatant in appropriate waste container. Repeat if necessary. Resuspend cells in 100 µl of diluted primary antibody (prepared in incubation buffer at the recommended dilution). Incubate for 1 hr at room temperature. Wash by centrifugation in incubation buffer. Discard supernatant. Repeat. Resuspend cells in 100 µl of diluted fluorochrome-conjugated secondary antibody (prepared in incubation buffer at recommended dilution). Incubate for 30 min at room temperature. Resuspend cells in 1X PBS and analyze on flow cytometer; alternatively, for DNA staining, proceed to optional DNA stain (Section E). Resuspend cells in 0.5 ml of DNA dye (e.g. Propidium Iodide (PI)/RNase Staining Solution #4087). Incubate for at least 5 min at room temperature. Analyze cells in DNA staining solution on flow cytometer. 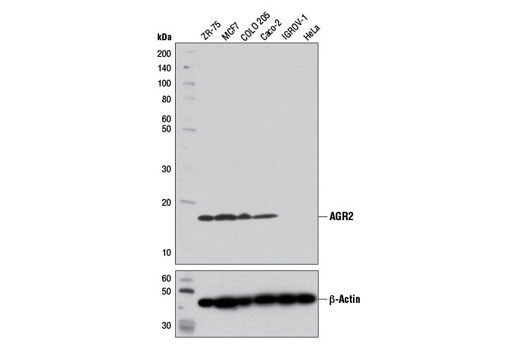 AGR2 (D9V2F) XP® Rabbit mAb recognizes endogenous levels of total AGR2 protein. Monoclonal antibody is produced by immunizing animals with a synthetic peptide corresponding to residues surrounding Ala29 of human AGR2 protein. Anterior gradient homolog 2 (AGR2) is a member of the protein disulfide isomerase (PDI) family of proteins and a homolog of the Xenopus laevis cement gland protein (1). 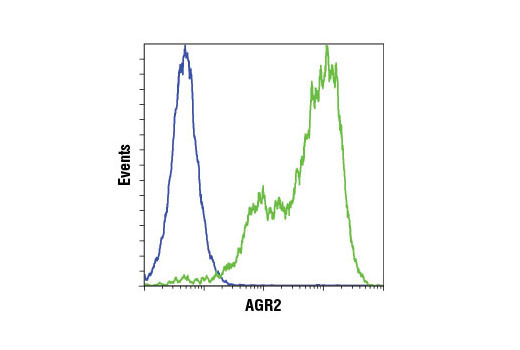 In normal human tissues, AGR2 is expressed most abundantly in intestinal cells. 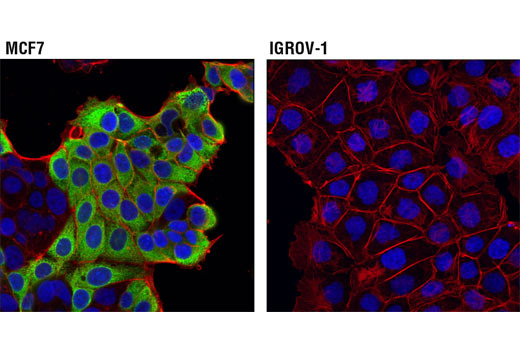 Research studies have found AGR2 is overexpressed in a number of adenocarcinomas, including those derived from breast, pancreas, ovary, prostate and esophagus (2-4). In vitro and in vivo studies have shown that AGR2 positively regulates cell growth and division, while its overexpression can promote cell transformation (5,6). The latter functions of AGR2 were shown to involve YAP1-mediated up-regulation of amphiregulin expression, implicating AGR2 in both the EGF and Hippo kinase signaling pathways (6). Maresh, E.L. et al. (2010) BMC Cancer 10, 680. Pizzi, M. et al. (2012) Appl Immunohistochem Mol Morphol 20, 31-6. Wang, Z. et al. (2008) Cancer Res 68, 492-7. Park, K. et al. (2011) Exp Mol Med 43, 91-100. Vanderlaag, K.E. et al. (2010) Breast Cancer Res 12, R32. Dong, A. et al. (2011) J Biol Chem 286, 18301-10. Alexa Fluor is a registered trademark of Life Technologies Corporation.